Valentine’s Day is coming up and Lacy is single. If that’s not bad enough, she has a secret admirer. Is he the compassionate, haunted detective; the ruggedly handsome businessman; the suave maître d’, the guy in her running group who stares too much; or maybe someone who’s not yet on her radar? She’ll find out soon enough because he’s invited her to dinner. Now the question isn’t how long Lacy will remain single…but how long she’ll remain alive. During the Sweetheart Run through the town of Cedar Mill a fellow runner is murdered and a notorious burglar called the Black Cat is found dead with an arrow sticking out of him. The press has dubbed the mysterious assassin the ‘Cupid Killer’. He has so far claimed two victims. There will soon be a third, but who will that be? The strange murders are somehow connected to the ladies of Run For It – Lacy the quiet divorcee, Stax the quirky bookseller, and Ruby the old-time mystery novelist. They’re back in a race against time to catch an invisible killer, figure out the identity of Lacy’s secret admirer, and exonerate an innocent man! Have you written a cozy mystery? Thought about writing one? The market has become rather glutted and dominated by a handful of authors, but there’s still hope! I’ve published three full-length cozy books in the last year: Running from Scissors and now Running from Arrows, both from my Running Store Mystery series, and also Slay Bells, the first of the Christmas Village Mystery series. I have spent a good amount of money marketing the books with varying results. The three best marketing tools you need to find and lure buyers are good cover art, an enticing book description, and reader reviews. In this article, we’ll talk about some different methods I’ve tried to boost sales and get reader reviews. First off, let’s talk about blog tours. 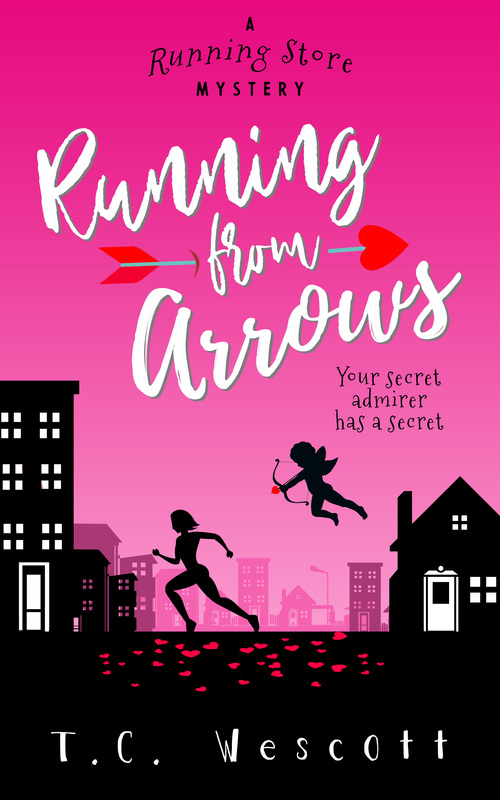 If you’re reading this, then you’ll know blog tours are a good idea, because I’m currently on a blog tour for Running from Arrows and have written this article for that purpose. Blog tours are an excellent and inexpensive way to let genuine book lovers know that you and your work exists so they can decide if it’s for them or not. Another method I’ve tried are the Goodreads Giveaways. At present, it costs $119 to host a standard giveaway and $599 for a featured giveaway. 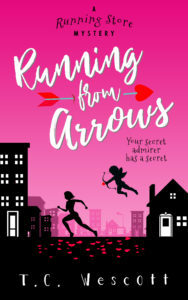 I’m currently in the midst of a standard giveaway for Running from Arrows with over 350 people entered to win one of 100 free Kindle copies. It’s too soon to pass judgement on this, but a couple of months ago I did a Featured giveaway for Slay Bells. As far as entries go, it was a smashing success. By the time my giveaway ended I had well over 2,000 people entered and was I humbled to see Slay Bells become the #1 most successful Kindle giveaway across all genres during the timeframe the giveaway took place. I suspect this is because of the cover art and the fact that Christmas-related books have a ready audience. This gave me exposure and about 65 readers started following me on Goodreads. Having said that, I’ve received only a few reviews from the giveaway winners and a couple were not even cozy mystery fans. They did not understand the mechanics of the genre and the reviews they gave were short, unenlightening, and not terribly positive. You take the good with the bad. Overall, I do not feel I got anywhere near the value for my $599. A Goodreads giveaway is just not a good way to get reviews. Now, if I’d had several other books in the series, the trickle-down effect might have eventually earned me more money as winners purchased other books in the series at full price. But if you have only one or two books in the series, a Goodreads giveaway is not your best option. What really got the reviews coming in early for all three of my cozy books was NetGalley. I joined Books Go Social and through them purchased NetGalley spots for only $37 each. A steal. How this works is you send Books Go Social your MOBI (Kindle) or PDF edition and they put it up on the site where readers all over the world can download it and read it for free. A number of these readers are book sellers, librarians, or bloggers, so if they like the book you get a great deal of additional publicity. And you’ll get anywhere from ten to thirty reviews on Amazon and Goodreads (my results). This is important because potential readers feel more confident purchasing a book if they see reviews for it from other readers, even if some of those reviews are negative. So, I strongly recommend Books Go Social and NetGalley. You can even get these reviews coming in before your book comes out if you’ve set it up for pre-order. Let’s talk about BookBub and Amazon ads. I have two non-fiction true crime titles and Amazon Ads have been wildly successful in promoting these. I’m making at least $4 for every $1 spent. The results have been the opposite for my cozies. I’m getting sales, but spending more money than I’m making in the process. This must be because more readers are clicking my ad and then not buying the book. At least not then. But Amazon’s algorithms (which I love!) will remind the reader later of their interest in the book and I’m sure this results in sales that don’t register as a direct ad sale. Having said that, Amazon ads would be more effective if you had a number of books in the series and set one or two up to be ‘loss leaders’, for which you reduce the price and run ads to bring readers into the series. You’ll lose money on the marketing for the books but hopefully turn a handsome profit as those readers purchase the other books in the series at regular price. The same is true for BookBub ads. For these you have to create your own ads and no one is better at making this super easy than Book Brush, so google that name and check them out. BookBub allows you to advertise your book directly to readers of specific authors and genres. I love this! And it has definitely generated sales for me. But to get a lot of exposure, I have to set my bid price pretty high, and because my books are priced relatively low ($2.99 for the Running Store books and $4.99 for Slay Bells) I once again end up losing money. 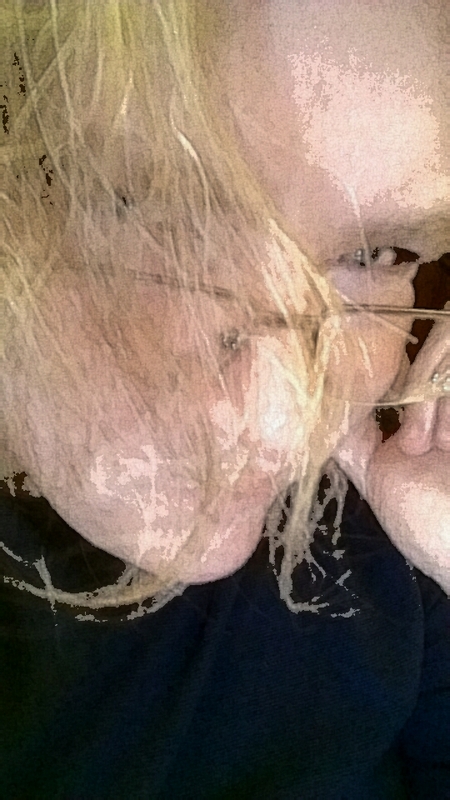 I will make it back once I have more books in the series and see the readers coming along with me on the further adventures, but that will take time. In short, if you’re publishing the first book in a series, prepare for it to be a slow boil. Do not price it at 99 cents in a desperate bid for readers. Keep the price at a respectable and profitable margin, do blog tours, experiment with ads but keep your budget low. And keep writing! Keep investing in good cover art! As your series grows, expand your marketing accordingly. Stop doing what’s not working and put more money behind what does work. Try many, many different ads to see what’s most effective. It’s fun, sometimes frustrating, but eventually it will be rewarding. You’ll notice I haven’t talked about putting your book up for a Featured Deal at BookBub. That’s because you’ll rarely get accepted. They now almost exclusively give the best spots to traditionally published and already established authors. This is unfortunate, but inevitable. However, keep submitting and occasionally you’ll get through. I was able to do two featured deals this year to the foreign markets (not U.S.A). I made money on both and gained a LOT of new readers. Running from Arrows became an Amazon International Bestseller as a result. It costs nothing to submit for a featured deal, but don’t be disappointed when they say no. You’ll get a lot more nos than yeses, but that’s true for all of us. Keep writing. Keep getting better. Keep putting that work out into the world and eventually you’ll find you have grown a reader base that follows you from book to book. It’s virtually inevitable. Take a look on Amazon and Goodreads at my three cozies to get an idea of what the fruits of my marketing are thus far and how I chose to compose my book descriptions for maximum impact.